While doing a little birding at Lamar Woods in Lamar,CO two days ago, I spotted a Mississippi Kite appearing to build a nest. All she had was a few sticks on a branch as shown in the top pic. She appeared to be easily disturbed and though I wasn't positive initially, I didn't want to take a chance of interfering with breeding behavior so I left and returned later that day. 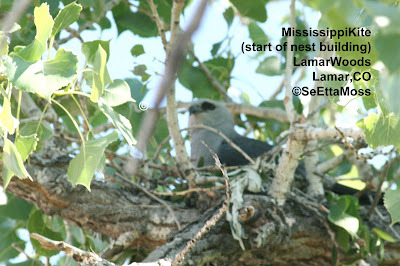 I found a Mississippi Kite (sexes look the same) in the area both in the afternoon but no bird went near the apparent site. I came back near dusk but didn't find any kites. I had some conservation stuff to do yesterday morning so didn't get to check on her again until yesterday afternoon--again I saw a kite perched in the area and also one flying high above but no indication of activity around the apparent nest.